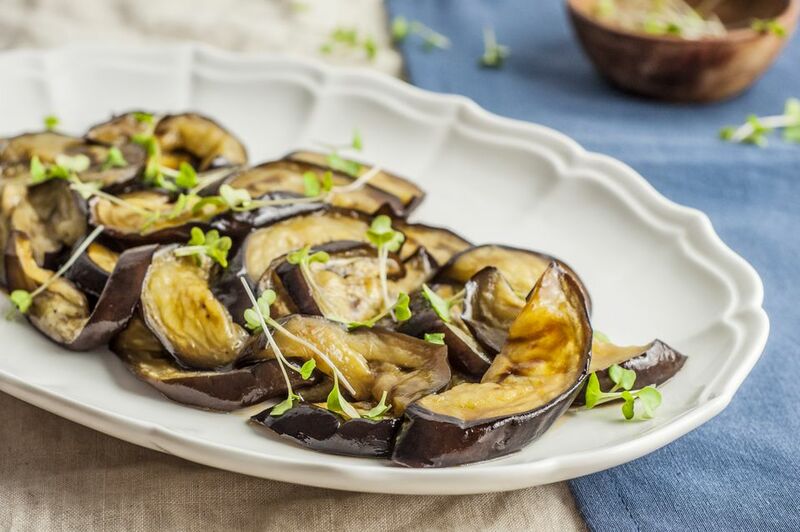 Fried eggplant is meltingly tender, to be sure, but baked eggplant can be just as tender and tempting, without the hassle, grease, and calories of frying. To keep things as tasty as can be, use a two-step method of brining the eggplant first to help it hold its shape and remove any excess bitterness, and then lightly spraying or brushing the eggplant slices with oil to get them nicely browned as they bake. This recipe can be doubled and tripled as needed. Work in batches as dictated by oven space and access to baking sheets. Want something crispy? Try oven-fried eggplant. Cut the eggplant into whatever shapes and sizes you prefer, being sure to trim off and discard the stem and the ends. Set aside. In a large bowl, dissolve the salt in about 1/2 cup warm water. Once the salt is fully dissolved, add 4 to 6 cups of cool water, mixing well. Meanwhile, heat an oven to 375 F.
After the eggplant has soaked, drain it, and pat the pieces thoroughly dry with paper towels. Lay the eggplant on a baking sheet (or sheets, depending on how much eggplant you decided to cook) in a single layer, not overlapping at all, and with at least a bit of space between them to bake evenly and attractively. Lightly brush or spray with oil. Turn all the pieces over and brush or spray the other side(s). Bake until the downside has browned nicely, 10 to 15 minutes. Turn all the pieces over and bake until that side is browned, too, about 10 more minutes. Use the baked eggplant in a recipe (like eggplant Parmesan or Turkish roasted eggplant salad) or serve them on their own sprinkled with salt, drizzled with balsamic vinegar, or topped with chopped tomatoes and/or basil. Why soak the eggplant in salt water? The process is called brining, and it uses the power of osmosis to help the eggplant hold onto the moisture in it while it cooks, which in turn helps it keep its shape instead of collapsing into a mushy mess. As a side benefit, it also seasons the eggplant nicely.